The final report for the AEMC’s Frequency control frameworks review was published in July 2018. The report details a frequency control work plan that sets out actions the Commission, the Australian Energy Market Operator (AEMO) and the Australian Energy Regulator (AER) will take to support the stable and secure operation of the power system in relation to frequency control. Stable frequency is an important part of maintaining a secure power system. Frequency varies whenever electricity supply does not exactly match consumer demand and uncontrolled changes in frequency can cause blackouts. As the generation mix changes to include more variable generation we need new ways to control frequency to deliver better frequency performance across the system. To date, the AEMC has made a number of rule changes to address the immediate system security needs of the transforming system. This includes requirements for networks to provide minimum levels of inertia and system strength, and new ‘last line of defence’ schemes to help AEMO better prepare for, and respond to, a system security emergency. The AEMC’s frequency control work plan, which is now underway, sets out actions to make the most of existing equipment as well as harnessing the power of new technologies to help keep the power system stable. It includes new rules and operating techniques, and more transparent and regular reporting of frequency performance to inform investment and operating decisions. AEMO published a consultation paper In November 2018. Virtual power plant trials planned for Q2 2019. AEMO to conduct a primary frequency control trial in the mainland NEM, building on experience from the Tasmanian trial. Complete. Revised causer pays procedure published by AEMO in November 2018. Industry to establish a set of nationally-consistent grid connection guidelines for distributed energy resources. The guidelines should include appropriate value and incentives for the provision of system security services by distributed energy resources. The ENA is developing technical guidelines through stakeholder consultation that will provide transparency regarding the technical requirements for distributed energy resources. In May 2018 the Electricity Network Australia (ENA) published its Distributed Energy Resources - Grid Connection Guidelines Framework and Principles.These principles will guide the continued development of the Distributed energy resources guidelines. AEMO expected to submit rule change request on frequency performance monitoring and reporting in Q2 2019. AEMO, in collaboration with the Commission and the AER, is exploring aggregator frameworks for participation in FCAS markets through VPP demonstrations. AEMO to assess the longer-term needs of the power system taking a holistic view of inertia, primary and secondary frequency control and any new needs. This will include assessing whether interim measures might be needed before long term mechanisms can be established. 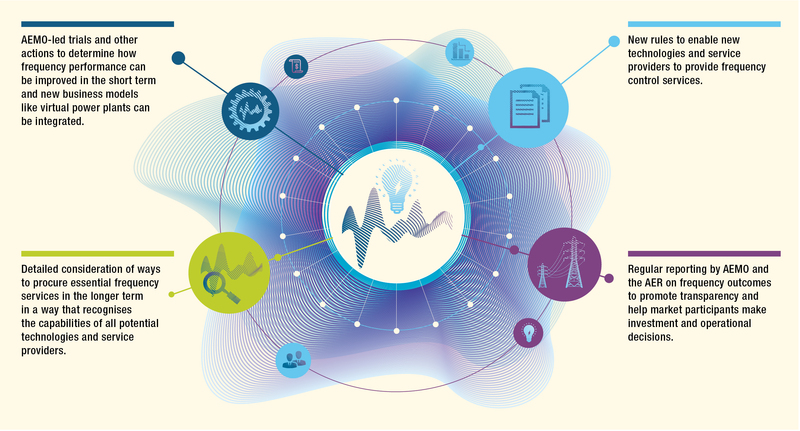 The AEMC to develop a mechanism to incentivise the provision of sufficient quantities of primary frequency control services (and other services) informed by outcomes from trials and international approaches. Reliability Panel to make further updates to the frequency operating standard when needed. AEMO to report on the outcomes of the actions set out above as results become available through its Ancillary Services Technical Advisory Group, Frequency Control Working Group and/or published reports.